Java and Microsoft integrations? Edge cases aren't always fully documented. 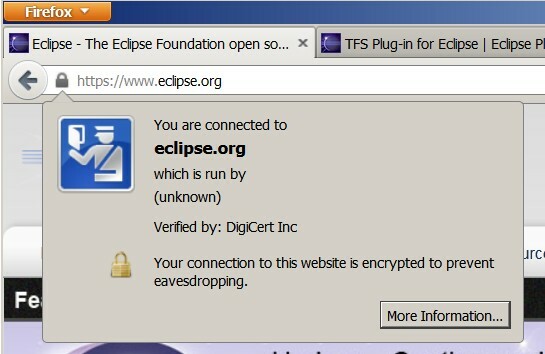 With SSL, the client (in this case Eclipse) needs to know whether to trust the certificate on the server. Usually, servers use certificates from Verisign, Thawte, and the like. Java ships with a file that describes those commercial certificate authorities that can be trusted. 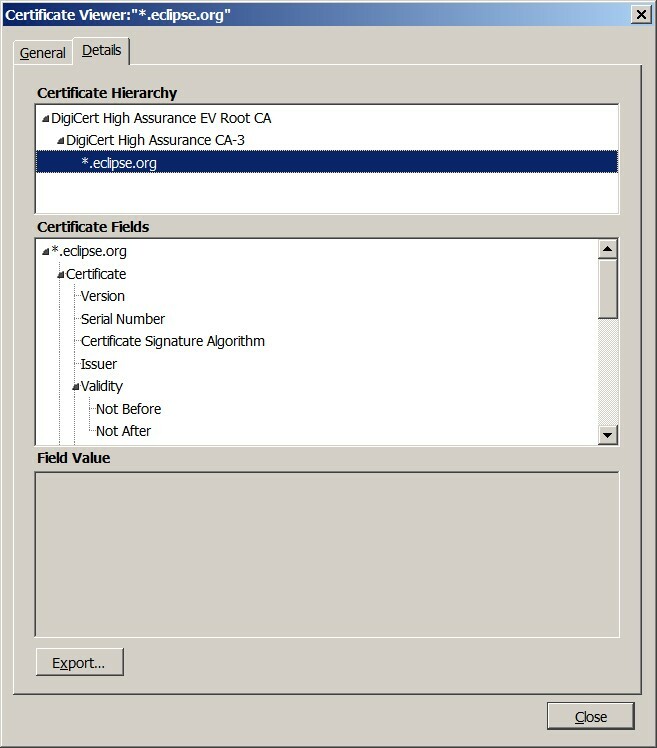 But if you're using a certificate or a CA that isn't recognized, then Java and by extension Eclipse won't trust the certificate. But you can tell Java to trust the certificates or CAs you need. There are at least three ways to do this. And now I can launch Eclipse (c:\eclipse\eclipse.exe) and connect to my TFS system (File->Import->Team->Projects for Team Foundation Server->Servers->Add->tfsrepo.mydomain.com). To download a certificate, use your web browser to visit the URL of the system. Use the browser's feature to look at the certificate. In Firefox, I click the lock icon in front of the URL, then click "More Information...," then click "View Certificate," then "Details." At this point, I have an Export button to save this certificate to a file, or I can use the certificate hierarchy to select the top-level certificate from the CA and save it. This page contains a single entry by bill published on January 6, 2014 8:20 AM. WCI Recurring Jobs Don't Party in 2013 was the previous entry in this blog. Monitor your network reliability is the next entry in this blog.